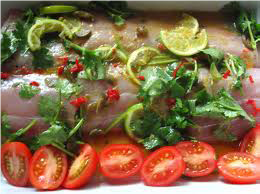 Place fish on top of a large sheet non-stick aluminium foil. Cover with garlic, ginger, and pepper. Place tomatoes on top of seasoned fish, top with squeezed lemon juice. Close up aluminium foil into a “pouch” so that the top and ends are sealed. Bake at 350F/175C for 10-20 minutes (depending on thickness) or until fish flakes.